It sounds like an insult to say that The Defenders is exactly what you thought it would be, but it isn’t. It’s a show that’s very aware of the expectations put upon it and the problems encountered by the other Marvel Netflix shows, and it knows how to best utilize its cast and its time. In other words, it’s great. Having seen the first four episodes of The Defenders, I can honestly say I was pretty pissed to not have been to able to watch the entire series. Now, granted, it’s usually in the second half of the season where Marvel Netflix shows have tended to flounder for a bit with filler; The Defenders only has eight episodes compared to the other series’ normal 13, which means it moves at a much faster clip than its predecessors—it doesn’t have any time to waste, which is a huge boon. The shortened season brings with it a sense of urgency, but the extra length afforded to the TV series means that, unlike its silver screen sibling The Avengers, a lot more time can be devoted to showing these characters getting to know each other. The early distrust feels natural and so does the eventual teamwork. This is not a show that skimps on the banter, which is better than the action. Krysten Ritter’s Jessica Jones makes you long for a second season of her show, and for it to come as quickly as possible. Her series depicted what was a very personal fight for her, and this show does a good job of using her buried-deep need to help and her not-so-buried curiosity to explain how she gets entangled with the Hand. The fact that she’s reluctant and almost hostile to getting involved is wonderfully true to the character and provides realistic tension. Mike Colter’s Luke Cage is similarly brought into the events with care and understanding about his character’s motivations that rings true. And thank god for him, because his reaction to Danny Rand (Finn Jones) actually makes Iron Fist bearable. The show gives Luke a personal stake in the conflict, which serves as a reminder of its victims in a way that giant blockbusters can’t (or don’t) manage. Is Finn Jones still so void of charisma that it’s still painful to watch Danny Rand? Yes. But thankfully, he is not on his own very much. He’s unavoidably still the point of entry into the story, but the second any other Defender arrives to puncture his self-importance, he fades into the background. 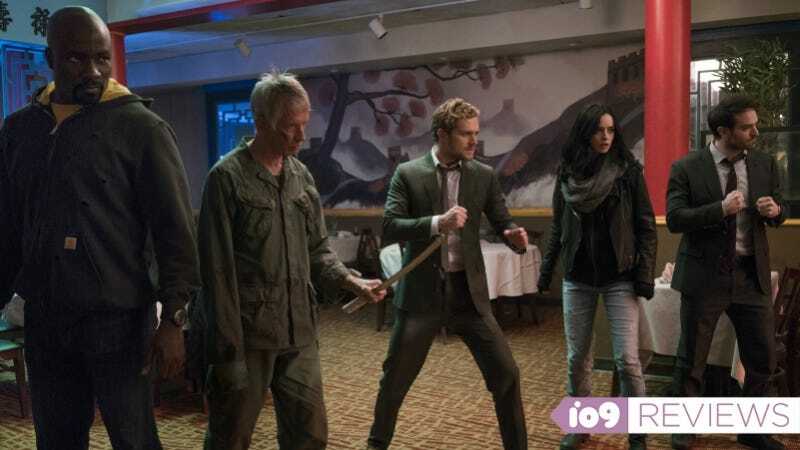 The Defenders recognizes, where Iron Fist did not, the many, many reasons people didn’t take to Danny Rand. Acknowledging his insufferableness by letting the othe characters recognize it doesn’t cure the mistakes of Iron Fist, but it helps. Actually, there’s evidence everywhere that the writers thought a lot about the questions viewers would have coming into the show, as well as the moments fans would love to see. If you’ve wondered about the weirdness of Daredevil being the only one of the four whose name no one knows, well, the show’s thought about that, too. It’s fanservice done right, without sacrificing the characters or the story. The Defenders has also done a better job with its villain than many of the Marvel movies have. Sigourney Weaver wonderfully inhabits Alexandra, a character who seems unconcerned with constantly dropping bits of knowledge she simply shouldn’t have. Her motivations are a bit clunkily explained, which is a shame because Weaver’s good enough to show them through her acting without needing an infodump. That’s actually part of the series’ biggest flaw: There is a lot of talking. Backstories, what happened between when we last saw these characters and now, who the villains are—everything is shown and told. While the banter is lovely and a single villain speech would be acceptable, there seems to be a fear that viewers would be completely lost if every bit of the story wasn’t explained out loud.